When I want a fresh, light meal I think of the Herb Box. Located in old Scottsdale, this wonderful restaurant sits on the canal front. This area allows for breezes to come through - much appreciated on a hot summer day in Scottsdale! If you choose to sit inside, expect a fashion forward design scheme. Wood rafters reminiscent of an old building provide a less formal feel. The overall look, however, is Pottery Barn chic. What the Herb Box does right: the use of local, organic greens. The Herb Box prides itself on serving not only good recipes, but high quality ingredients that help the local farming community. Many of the menu items change seasonally as well as daily based on what can be found at the local farmer's markets. So before you choose something on the menu, wait to hear the specials as I am often disappointed when I forget and see someone else's amazing special plate! Onto the food and beverage. The Herb Box offers an ample wine and beer list - even offering beer tasting flights. As for alcoholic beverages, they have a decent list of spirits including local herbs and fruit - try their whiskey smash: muddled limes, lemons & mint, buffalo trace bourbon, house mango lemonade, rocks or their Sun Devil margarita: fresh cucumber, agave nectar, fresh squeezed lime, tanteo jalapeno tequila, rocks for fun! For the non-alcoholic drinkers, they also offer 4 different iced tea flavors brewed daily and light fresh juices and flavored drinks. Food! Well - this depends on the day you arrive. I typically head there for lunch or happy hour (3-6pm) so I will start with some suggestions there. I love their fresh spring salads such as the Grow Happy salad with chicken added: organic greens, cucumber, tomato, feta, radish sprouts pepperoncini, pepitas or the Urban Market Steak Salad: watercress, avocado, sweet red pepper, sugared pecans, bacon, sweet dried corn and house blue cheese vinaigrette. If you prefer sandwiches, try their Grilled Chicken & Sage Pesto sandwich with goat cheese, gala apple, and smoked bacon or the Smoked Turkey Ciabatta with gouda, wood smoked bacon, sweet tomato, and roasted red pepper aioli. I will warn you that they provide an ample portion of food - you might want to split a sandwich, salad, and save room for one of their delectable desserts! If you are looking for breakfast while staying in Old Scottsdale, don't forget the Herb Box also serves a lovely Sunday Brunch. With items on the menu such as red velvet pancakes, Bourbon-Ginger Peach Brioche French Toast with crème friache, and applewood smoked bacon and the Smoked Salmon Hash served with crisp fingerlings, pancetta bacon, scallions, fried capers, aioli, soft egg.... you can't go wrong. So - make sure to put the Herb Box on your list of great restaurants! They offer a great atmosphere to take family and friends and enjoy the outdoor weather. Enjoy! During my recent trip to Seattle I stayed at the fabulous Kimpton Hotel Vintage Park (click here to read my review). 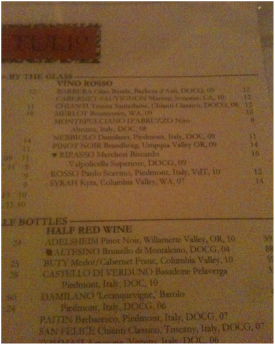 Being a Kimpton InTouch member, I received $20 of free food at the hotel so I booked a reservation at Tulio for 6:15pm. As you walk through the lobby, you enter the restaurant through antique revolving doors that open into a warm and welcoming italian trattoria. I walked to the hostess stand at the front and they offered a seat in their bistro or main dining room. I chose the main dining room for the ambiance. I lucked out that November is restaurant month for Kimpton which means they offer a 3 course meal for $35 at many of their hotels. Make sure you follow the instructions to make a reservation and add "kit menu" in the special instructions area if you want to participate! I asked the waiter if I would have a special menu or had to pick from a list and he explained I could choose ANYTHING on the menu I wanted. So, I asked him for his favorites and he shared about 10 items on the quaint list. He then went on to explain each dish elaborating on the flavor combinations and pairings. I was thoroughly impressed and asked him to order something for me, which he graciously did. So I sat and enjoyed a glass of Montepulciano D'Abbruzzo when my starter arrived. I chose the burrata, beet, and grape salad. Let me tell you.... this was divine! Not only was there two different types of beets delivering distinctly different flavors, but the plate was lined with a cranberry/beet vinaigrette. If you have not had burrata before, envision fresh mozzarella, yet creamier. The light delicate cheese paired nicely with the fresh sweet beets and the lightly acidic beet vinaigrette. As I took bites combining all the elements on the plate, a synergy of fresh lightly sweet flavors were present. This was such a refreshing start to the evening. Next up was the main dish and the highlight of the dinner: the veal chop. I ordered this medium rare and was impressed by the size and presentation when it finally arrived. The chop is covered with creamy spinach, leeks, truffle oil, and finally crispy prosciutto What made this even more divine was that the chop was STUFFED with mozzarella. At first glance, I was a bit intimidated by the size of the dish, but after I took one bite, I knew I would finish it in entirety and potentially lick the plate! Just like the beet salad, this dish was a phenomenal combination of flavors that played on each other beautifully. The creamy spinach and truffle oil lining the bottom of the plate was a wonderful sauce for the stuffed meat. And the prosciutto's crunch gave each bite texture and flavor. As I got to the end of the plate, I had finished off the proscuitto and the spinach. I recognized that without those elements, the flavor was ok, but nothing special. Chef Walter Pisano is a master at combining tastes and textures. I thoroughly enjoyed this plate so much, I would potentially make a trip back just to have it again. Just keep in mind the normal price is $38, so probably not in the budget as a regular. I finished my trio by choosing the pistachio semifreddo. For those of you not familiar with a semifreddo, it is a half frozen creamed dessert. Envision a more airy version of gelato that doesn't melt as fast! This dessert would be the pistachio lover's dream. I do like the flavor, however, each bite was filled with nuts which are not my favorite. The semifreddo was paired with orange infused chocolate pieces which again is not my favorite. I would personally try the cannoli on my next visit, but this was a nice end to the evening. I highly suggest you try Tulio's during restaurant month. This was hands down one of my top 15 meals I have ever eaten! Caliente! When you live in the southwest, you search out local Mexican restaurants for the taste of local traditions. I like to categorize these type of restaurants in two ways: southwestern fresh-mex vs. traditional mexican. Blue Agave falls into the first category, fresh-mex, which nationwide is the most common. 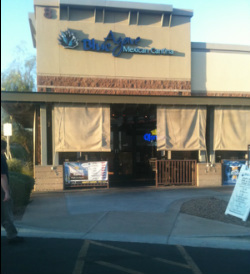 Located in North Scottsdale off of N. Scottsdale Rd. south of the 101, this little gem is filled with wonderful tastes, local musicians, and a patio with misters (great to beat the heat!). Inside, you are welcomed by an interior filled with spanish flair and a bar area filled with neon "fiesta" lights. We chose to sit in the dining room filled with dark granite tables and red walls. Lanterns and pendant lights drop from the celiing. We walked in last night around 5, which still happened to be happy hour. 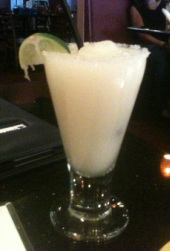 So, I started off the night by trying their signature margarita - frozen. I mean, only a true mexican joint can make a solid margarita that doesn't taste like sweet syrup, right? Blue Agave surprisingly came through with a solid version. The flavor was refreshing with a healthy amount of tequila - not overpowering, but still enough to give it a kick. I couldn't complain about happy hour prices either, $2 off margaritas, $3 off beers, $3 off appetizers. You could easily sit and eat munchies throughout the evening on a budget. eating the chips and salsa all night, however, as I sat there smelling the wonderful dishes coming out of the kitchen, I decided I needed to order real food. What it lacked in traditional looks, it made up in taste. The chicken was spiced with cumin, cinnamon, cayenne and a few more flavors I could not pick out. The pico de gallo and cheese was pretty standard tasting, but the dipping sauce packed the finishing touch it needed. I wish they included some of the sauce in the original presentation, but not much to complain about in the full picture. The black bean mix had a nice blend of flavors, but the side of rice was nothing special. Now on to the southwestern wrap! This was the most americanized dish perhaps on the entire menu. Again, what looked pretty standard packed an immense amount of flavor. The southwestern wrap's interior included the same marinated chicken in the oaxaca chicken tacos, lettuce, traditional cheese, lettuce, ranch, and a cactus dipping sauce. Again wonderful flavors, but I wish they included some of the dip in the actual wrap to give it a little more flavor. The fries, very strange for a mexican restaurant, were pleasantly flavored with cajun spices that gave it just enough zip. As we were winding down our meal, we ended up being entertained by two guitar players singing modern hits. They were pretty good and I could imagine sitting and listening to them throughout an evening. So in all, I would not consider this a hit out of the park, but rather a wonderful spot tucked into the corner of a busy shopping area worth a trip! Nestled into the foothills of North Scottsdale, this quaint eatery aims to please. Julien and I tend to neglect this area north of the 101, so we were finally excited to make our way over here. Rhythm and Wine's concept as you already guessed is iconic music mixed with wine. As you walk in the walls are lined with photos and posters of classic musicians and their music played softly in the background. Throughout the restaurant there were people of all ages from 20 - 80 and a few parties were hosted in the patio area since it was a lovely 80 degrees outside. Now on the best part: the yummy food! We walked in around 5:30 surprised to see a very healthy crowd had developed. The hostess apologized deeply for not having a table available at the moment and was kind enough to point us to the bar where we could still enjoy their happy hour ($3 off wine, $2 off liquor, $1 off beer for those inquiring minds). We sat down and ordered the Santa Christina Antinori Sangiovese and the Freakshow Cabernet while wonderful smells wafted from the kitchen. When our table was ready, we were seated outside at their welcoming patio with sunset views. We were immediately served a plate of warm bread with some dipping sauce which was a mix of EVOO, balsamic, and a roasted clove of garlic. I was quite hungry, so we scarfed that down and moved onto the menu. Let me tell you! The theme continued on to the names of every dish: “THE SGT. PEPPER-RONI,” "BARRY’S WHITE," "COURTNEY LOVES THIS CHICKEN PASTA,"	and "WE GOT THE BEET" SALAD." Very cute! After watching everyone else receive their food around us, we settled on the bruschetta and their "Hall of Fame" thin crust pizza. You get to choose three of their four types of bruschetta: Roma tomato with mozzarella and basil ~ Proscuitto with candied walnuts and asparagus ~ Brie and apples with fig jam ~ Pesto salami. We skipped on the proscuitto with walnuts due to Julien's nut allergy. For the pizza, we ordered the "Meaty" which was topped with Prosciutto, salami, pepperoni, red sauce, mozzarella and Irish cheddar. The bruschetta was scrumptious - and I think the best part about it was they conveniently pre-sliced them in half making them easy to share and less mess. Hands down our favorite was the pesto salami and if we tried the dish again we would get two of those and the mozzarella basil. The pizza came next and was positively yummy! The sauce was homemade and had just a tiny bit of spice. You could tell they truly pride themselves in the craftsmanship of simple dishes. The toppings were arranged symmetrically giving every bite some flavor from the toppings. The cheese also was very yummy with the mix of cheddar and mozzarella. they were twin teenage girls, I was intrigued to hear what they might play. Once they finally setup, they played a very diverse mix of music from classic to modern including artists like Adele. If we had not planned to go to the comedy club afterwards I could envision sitting outside and listening to them sing most of the night. So thinking about the entire experience, I have to give it a thumbs up 4 star score. 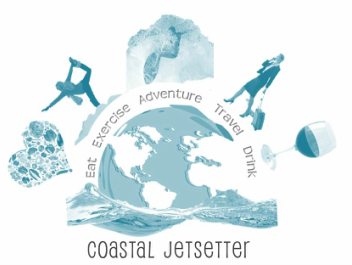 This may be off the beaten path, but one worth a drive and visit!